After 17 years of trying to master the game of golf, I became interested in gaining strength in order to hit the golf ball further. A few months into training the squat, bench, and deadlift, I lost interest in golf and wanted to pursue powerlifting. I found Ford’s Gym in Madison, WI and learned a lot about the sport from Ford Sheridan and Rick Schwalbach. While training at Ford’s and watching videos of USAPL and IPF meets on YouTube I became increasingly enamored with the idea of perfecting the power lifts and putting myself to the test on the platform. A year into lifting I entered the USAPL Badger Open and got to compete alongside the defending World Champion, Dan Williams. I was hooked! Here was someone that weighed within 3 pounds of me, and was totaling nearly 600 more pounds. So I set out to learn how to better use powerlifting gear, and see how good I could get at this fantastic sport. And 4 years later, it has been a tremendously rewarding endeavor. I’ve been able to compete at two USAPL National Championships and have gone from totaling 1268@177 to 1730@204. Although I am very pleased with my progress, I am still roughly 200 pounds shy of the National Champion in my weight class and I’m just as intrigued as ever to figure out how far I can go. 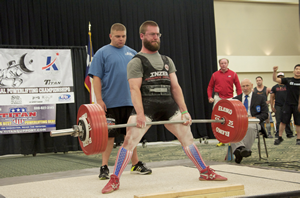 The Wisconsin USAPL Advisory Group has been formed to assist the state chair with the development of a strategy to promote drug-free powerlifting in the state and in the mid-west. The group is comprised of ten members who represent high school coaching & teenage competitors, age divisions of open, collegiate and masters. Five of the members are certified referees. There is also fairly decent geographic representation from around the state; Madison, Racine, New Richmond, Milwaukee, Osceola, Eau Claire. Several members had voluntarily offered their assistance in the past and I took them up on their offer. We have so many talented individuals in the state who already give quite a bit of their time to the sport and I wanted to create another opportunity where the offered assistance could be leveraged to grow our support network. You will soon learn a bit more about what the group comes up with as we brainstorm on how / what to promote about this great sport.